Chinese development giant Poly will test the market with the launch of its first Sydney project - Poly Horizon - at Epping this weekend (March 12). 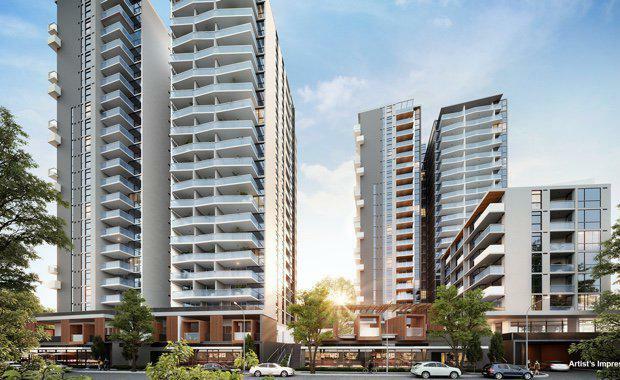 Located at 28 Cambridge Street, Epping, the landmark $200 million mixed-use precinct, will comprise more than 500 apartments across one 22-storey tower, one 21-storey tower and a third low-rise tower. The first stage comprising 235 apartments will launch this weekend. Designed by internationally acclaimed architects, PTW, the ambitious project will set the benchmark for the revitalisation of the Epping town centre. The towers will feature a striking reticulated façade that will create a dramatic architectural statement for the surrounding area. The first stage of the project will see studios starting from $420,000, one-bedroom + study apartments starting from $550,000, two-bedroom apartments from $820,000 and three-bedroom apartments with car parking from $1.06 million. Poly Project Director Steve Wang said the launch of the company’s first project in Sydney will create a vibrant new residential precinct. “Residents of Poly Horizon will be able to enjoy an enviable offering of on-site retail including vibrant cafes and restaurants as well as a new connection to the local Rawson Street shopping precinct,” Mr Wang said“A beautifully landscaped podium courtyard and the unique retail offering at Poly Horizon will create a real sense of community within the project. CBRE Residential Projects Senior Director, Tim Rees said the project will appeal to discerning buyers looking for a conveniently located apartment in Sydney’s leafy northern suburbs. “Poly Horizon is only a short drive to major regional shopping destinations including Top Ryde, Chatswood and Macquarie Centre. The development will also appeal to young families with a proposed childcare centre in its ground floor; and is within close proximity to local primary schools as well some of Sydney’s most prestigious high schools and universities,” Mr Rees said. “Located only 300 metres from the recently upgraded Epping train and bus stations, the project also enjoys excellent public transport access to the commercial hub of Macquarie Park, the sparkling Northern Beaches and Sydney Olympic Park. And with the M2 Motorway moments away, residents will be able to access the Sydney CBD within a 25-minute drive.